Good morning and HAPPY FRIDAY, friends! 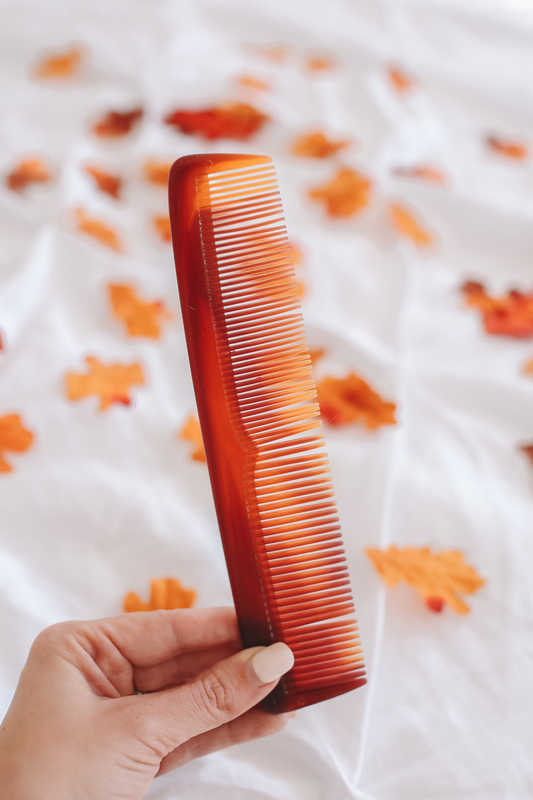 I wanted to update you all on my hair routine, especially as we head into cooler months – which can be really damaging and drying for your hair! This week has already cooled off a TON in North Carolina (I just tried to take Winnie for a walk wearing sandals and had to come back in and put on my UGGs hahah!). I find that my hair is always so much drier in the fall and winter, so I put a lot of focus on getting the moisture back in. Read on for the hair routine that I live by! If you want to grow your hair out, make sure you’re getting enough vitamins and nutrients every day! I’m not taking any hair growth vitamins right now, but in the past I’ve used these and they really work. Right now I’m focusing on getting all my vitamins from my food – eating as many veggies and leafy greens as I can! One of the best known vitamins for hair growth is a B-vitamin called biotin – you’ve probably heard of it before. Biotin is associated with having glossy hair, glowing skin and strong nails and is found naturally in egg yolks, almonds, cauliflower, cheese, mushrooms, sweet potatoes and spinach. These are all foods I try to eat daily! I used to blow dry my hair, straighten my roots, then curl the ends multiple times per week. I realized a few years ago that this was really wreaking havoc on my hair! I had so many split and dead ends from using so much heat on my hair every week. Nowadays I try to wash my hair as little as possible (as I mentioned above), and I only blow dry and curl it once a week. I stopped straightening it altogether. On weeks that I don’t take photos, I let my hair dry naturally and keep it in a braid or a messy bun (or I wear a cute baseball cap!). When I do style my hair, I use this hair dryer and this curling wand. My hair dryer is the FASTEST dryer I’ve ever used – my hair is dry in less than 15 minutes (other dryers it can take up to 30!). The dryer also has a built-in ion generator and puts out negative ions to help smooth the hair cuticle. I love it (and it’s easy to travel with, too). I’m also obsessed with my curling wand – it does get really hot, but I never set it to the highest heat setting. Another pro is that it does an amazing job of curling my hair so that my curls stay all week – I rarely have to re-curl my hair during the week. And less heat equals healthier hair! 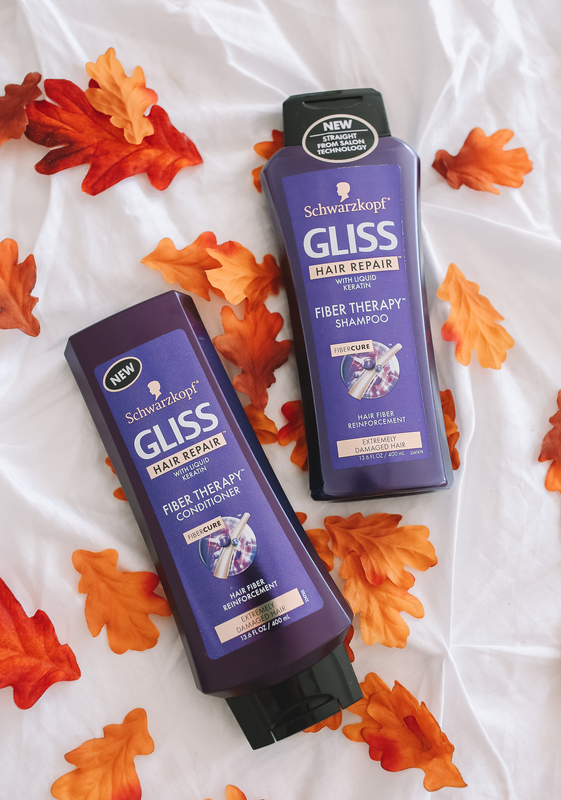 In addition to using the Gliss Fiber Therapy shampoo and conditioner, I also use a the Schwarzkopf Gliss Fiber Therapy Repair-In-Oil spray weekly. This product just won an Allure “Best of Beauty” Award, which made me really happy because I’ve been using it for a while now! According to Allure Magazine, it’s “part treatment, part styling spray: The keratin-rich oil clings to hair and plugs tiny holes in the cuticles, delivering silky blowouts and nonstop smoothness.” In addition to using this product as a styling spray, I also use it as a deep conditioner! The night before I wash my hair, I spray a lot of this on the ends of my hair, wrap it in a bun and sleep on it. My hair soaks up the oil overnight and really retains the moisture when I wash it the next day. When it comes to combs and brushes, be gentle on your hair! Whenever I’m in the shower, I apply my conditioner (after I’ve shampooed, of course), then shave or epilate my legs to give the conditioner time to set in. Then I use a wide-tooth comb and go ahead and comb through my hair in the shower with the conditioner in it. I find that it’s WAY easier to get out tangles this way! Then I rinse out the conditioner, get out of the shower and comb through it again to get rid of excess water. This comb is the one I use but I only use the side with bigger teeth. For brushes, I like this Wet Brush because it’s gentle on your hair (although I only use it on my hair after I’ve gotten all the tangles out with my comb). For blow drying, I use a 55mm round brush like this one. It really helps to get my hair smooth and straight while I’m drying! Believe it or not… I don’t really use hair ties! I use a big claw (like these) when I want to put my hair up and get it out of my face. Whenever you put your hair in a ponytail and use a hair tie, it puts pressure on your hairline and damages your hair follicles – ESPECIALLY if it’s a tight ponytail! I’m also conscious of this when I work out – keeping your hair in a ponytail can cause breakage around the hair tie because you’re usually moving a lot or jumping around. I go to Pure Barre 3 to 4 times per week and braid my hair in a loose braid each and every time – this doesn’t put too much pressure on any part of my hair, but still keeps it out of my face. If you have any questions about my hair routine, feel free to leave them in the comments and I’ll get back to you! Happy weekend, everyone! Great tips, thanks for sharing those! 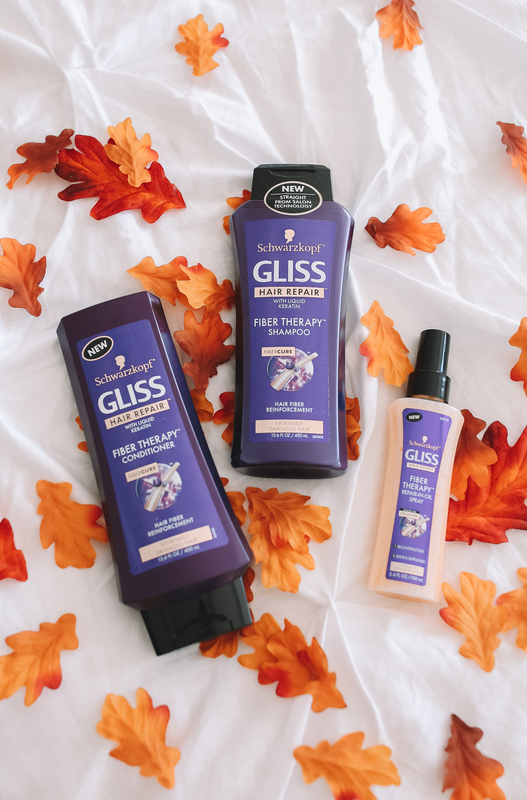 I love Gliss products, they are super affordable, the conditioner works great and they smell amazing – just like salon products! Great tips! Thank you for sharing (: And I’m definitely going to check out the T3 dryer! I’m in need of a new hair dyer! I have a similar hair routine but want to be better about wearing my hair curled because I like how it looks more. How do you revive your curls each day if you only curl once a week? Do you avoid putting a brush/comb through it? Yes, haha! Once it’s curled I don’t brush it every day… if I have tangles sometimes I do run a wide-tooth comb through it. When I go to bed at night, I put all of my hair above my head on top of the pillow and sleep like that the entire night – that way I’m not smashing it with my head if that makes sense haha (sounds super funny). Thanks! I sleep with mine that way too. Do you put any products in it the next morning? Mine just tends to get frizzy/lots of flyaways the days after curling it, so I generally tame with Moroccanoil but wondered if I should be doing something else! Haha! Which dry shampoo do you use? I also have brown hair and haven’t found one I love yet. Loved the post…great tips and excellent photography I must say! What dry shampoos do you use to go that long with such a few washes?? Your hair looks gorgeous as always! Thanks for sharing! Just wondering: you said you rarely have to recurl your hair during the week. Do you think this is because of your hair’s thickness/texture or the curling wand or when you curl it (right after drying it or wait a few hours)? My curls always fall out the same day (I put some hairspray in but I try to avoid it since it makes my hair feel weird) and I’m so impressed that your curls stay in so long! Do you like the Gliss better or the Cavier line you’ve mentioned in the past?? How do you keep your hair from getting frizzy with the NC humidity? What kind of dry shampoo do you use? Great tips , Thank you for sharing ! Which dry shampoo do you use? What do you use to put your hair in a bun at night? 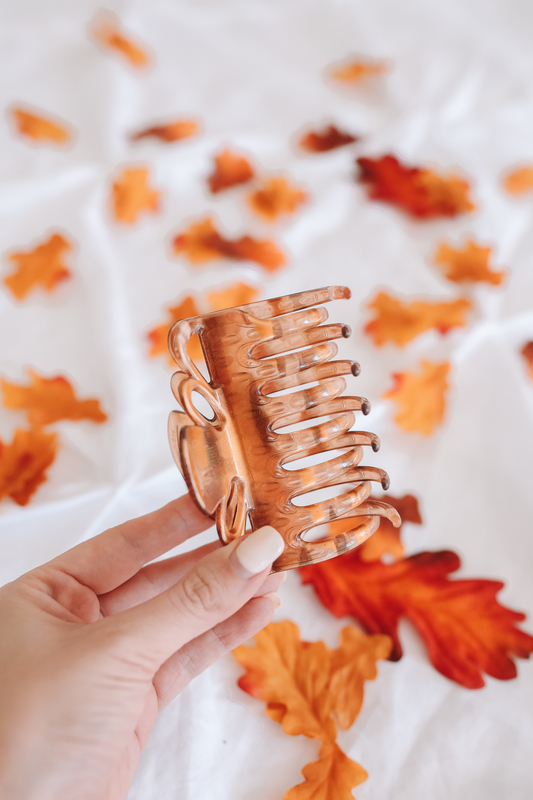 I’ve been using the invisibobble for a while – is this ok or would you not recommend it because it’s a ponytail? Thanks!! After you curl your hair, do you spray it with hairspray or use a serum to keep the curls intact? Or do you just brush? Great post! What heat protectant do you use? I have the T3 wand but it burns my hair even on lower settings. Also what heat setting do you use on the wand? Thanks so much for the tips! This is so helpful as I have dyed my hair over the summer a few times (I am done now coming into the winter months) so I have worked very hard to keep my hair healthy and I have done a pretty good job so far but this help so much! Hi! First time commenter – love the blog! I noted you wash your hair once-twice a week, but also actively exercise! I have seen other bloggers keep the same hair care routine, but really don’t seem to be very active. As someone who is also active, does the dry shampoo really do the job on sweaty-wet hair? Also, will you shower but throw your hair in a shower cap some days too? Would love to know all the secrets so I can add this to my daily routine! Thanks! Hey Elle! I go to pure barre classes 3 to 4 times per week but I actually don’t sweat that much in class! Don’t get me wrong, it is a really hard workout, but it isn’t like a cardio class where you leave dripping sweat. I think this saves my hair – if I got really sweaty then I would HAVE to shower! I like to take baths during the week, and yes, sometimes I do put my hair in a shower cap to hop in the shower! Great post, Caitlin! You gave me some really good tips to take care of my hair during the colder months. 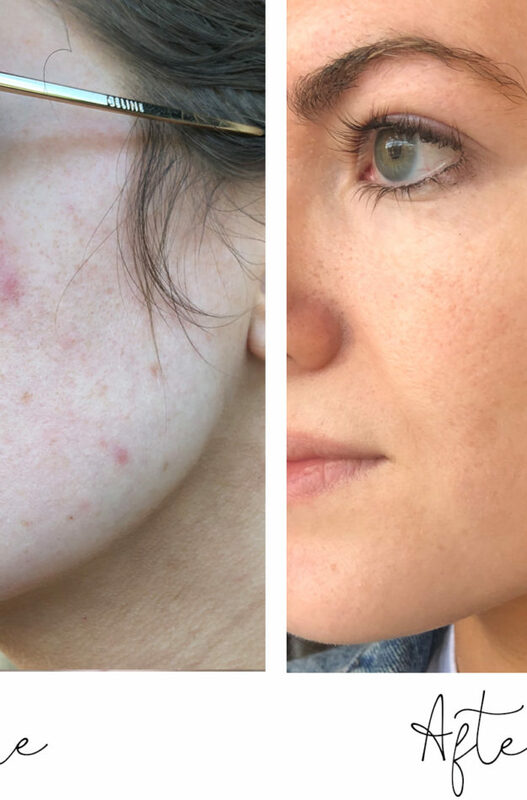 I would love to read a similar post about your skincare routine fall/winter edition. It would be so helpful for me. Do you sleep in a bun every night? How do you keep your curls overnight? Love your blog! Just wondered, if you ever sleep with wet hair? If you do, what is your tip vs the hair just being loose all over the pillow/getting the pillow wet. I sometime am in a hurry or too tired and I don’t blow dry it. If anyone has tips, please share! 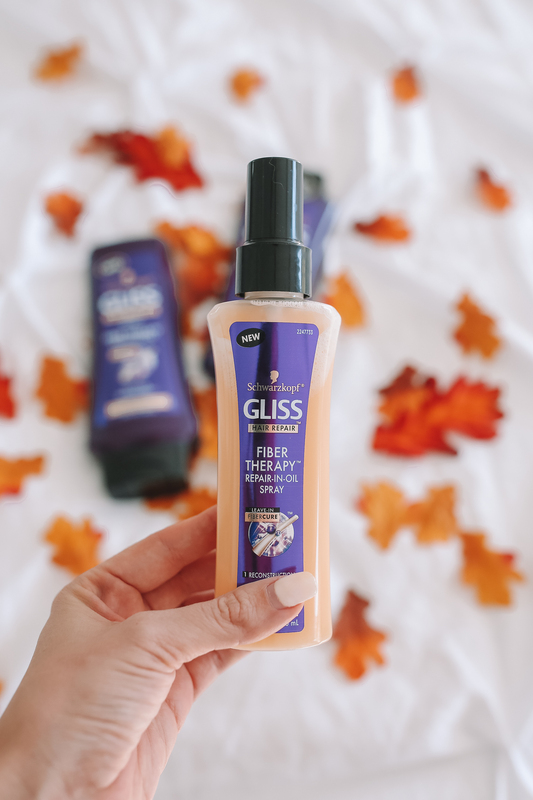 You shared your hair routine in the past and swore by completely different products (I think the Caviar line) – I noticed that this post was paid for by Gliss… Can you clarify if you now prefer Gliss, or if you’re solely using it now in the Fall, or alternate it with the Caviar products? 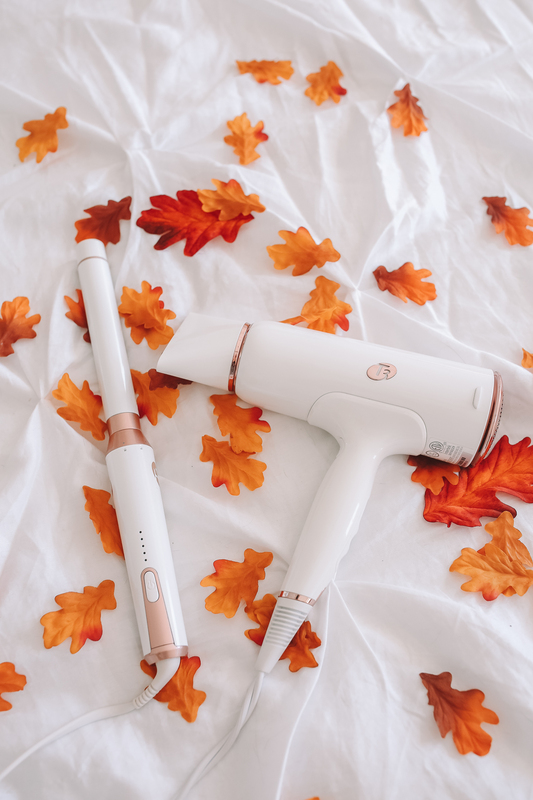 I brought the hair dryer after reading your last hair care blog post, it truly is amazing, so quick! And will definitely be buying the dry shampoo you recommend. It’s so refreshing to have a blog to follow with someone who has naturally thick brown hair! I do have a question about the wand, it’s going to be my next treat for myself. What size barrel do you use? And what heat protection spray do you use, if any? I have had oily hair all my life. Any tips for me? First time on your blog and I love your tips! Any certain way you sleep on your hair to hold the curls that they don’t need retouched? Also, do you use hairspray/rootlifter? You have so much volume! Love your blog!! What dry shampoo do you use?? First time commenting…thanks for the post, your hair is gorgeous! Totally off-topic, but is that a Ragdoll cat you have? I just got my first Ragdoll kitten two weeks ago and I am SO in love! His name is Buttermilk and he is a blue-mitted. I did a ton of research beforehand so I knew to expect him to be very affectionate, but I am totally blown away by how sweet and friendly he is. He literally follows me everywhere around the house, including the bathroom! Actually right now he is lying on his back next to my laptop with one paw on the keypad. Anyways, thanks again for the post. Hugs from Texas! Aww yes mine is a Ragdoll too! His name is Prince George. I adopted him when I had my first “big girl” job after college and was living alone in an apartment! He is my buddy and has been with me for five years now! Ragdolls are the BEST and have such big personalities! You have the BEST hair! Thanks for the info!! Oh my gosh! I never knew that about a pony tail, thanks soooo much for sharing! And I need that blow dryer, it dried so fast, that will be life changing! Thank you for the hair tips! I have been wanting to splurge on this hair wand and I think I will soon for the holidays! Thanks for being such a genuine influencer! I wish i could live a life like you haha! I need to follow this routine! Thanks for the details! Love all these tips! THANK YOU for sharing! Perfect stocking stuffer idea! Hi there! Would this be better than the Caviar Anti Aging shampoo that you’ve previously mentioned? What is better for dry, damaged hair with a lot of breakage: Caviar or Gliss? ?